The Elwood Fire Company was called out at 4:10pm for a landing assignment at Lawman's supply on the White Horse Pike due to a gun shot victim. Engine 16-3 arrived at 4:14pm and set up the landing zone and assisted Hammonton Rescue and Medic in transferring the patient from the ambulance to the helicopter. All Elwood units were clear at 4:45pm. All four Mullica Twp fire companies were called out at 9:20pm for the report of a chimney fire at 1248 Willartz St. All others companies were recall with the exception of Elwood Station-160 by 16-01 on location. Engine 16-3 along with Tanker 16-5 responded with full crews. On arrival at 9:24pm the crews removed the hot embers and cleared and remaining burning material with chimney cleaning tool and used an electric fan to remove smoke from the home. The home owner was advised to have the chimney professionally cleaned and inspected before using. All units were clear at 10:03pm. Station 160 was called to assist Nesco station 161 on a motor vehicle accident on Route 542 at Nesco Liquors. 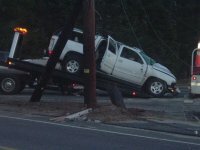 The vehicle left the roadway and struck a utility pole and fiped over. One person was transported to Kessler Hospital by Hammonton Rescue. Engine 16-3 and Rescue 16-4 responded. Elwood was recalled shortly after rescue 16-4 arrived on location at 4:47pm. All Elwood units were clear at 5:19pm. Jan 21st at 11:55pm The Elwood Fire Company responded to a C/O alarm at 426 Hamburg ave. Engine 16-3 with a crew of 6 and Tanker 16-5 with a crew of 4 along with the Chief responded and used C/O detectors to confirm the false alarm. All units were clear at 12:15am. *EVFC members can listen to the whole call recording by logging in and going to the *Members Only* media gallery. While The Elwood Fire Company was on a cover assignment at Hammonton on Saturday the 19th. They were called to a report of a possible structure fire at 68 South Chew Rd. at 6:33pm. Support 16-1 and Engine 16-3 responded with a crew of 7. On arrival at 6:39pm they found the fire was put out by the home owner with a fire extinguisher. The EVFC crew removed the microwave that had caught fire and checked for extension with the thermal camera . They also used a positive pressure fan to remove smoke from the home. All units were clear at 6:56pm. Tuesday the 15th at 5:15pm the Elwood Fire Company was again call to 3411 Moss Mill rd to assist Hammonton Rescue with lifting a patient out of their home and assisted them in taking him to the hospital. Support 16-1 with at crew of 4 responded along with the Chief. They arrived at 5:21pm and were clear at 5:45pm. Monday the 14th at 7:05pm the Elwood Fire Company was call to 3411 Moss Mill rd to assist an Atlantic Care unit with lifting a patient into their home. Support 16-1 with at crew of 4 responded along with the Chief. They arrived at 7:10pm and were clear at 7:26pm.